If you’re anything like me, at any given time you have a dozen to two dozen tabs open across multiple web browser windows. It’s great to have all these webpages open and ready to click on at any second, but it’s a nightmare to try and remember where each is with so many open. I shudder to think how much time I waste on this each day. Luckily, Mozilla is working on a solution. 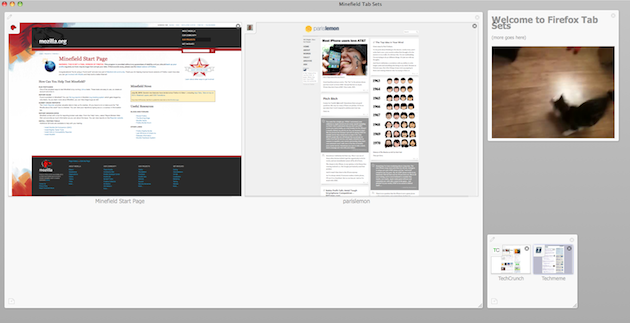 A new feature called Tab Candy is in the works. It’s still early in testing mode, as Mozilla’s Aza Raskin points out on his blog today, but it looks to be exactly what I need. Be sure to watch the video below for a full overview — from the looks of it, it seems as if Tab Candy is sort of like Apple’s Expose feature mixed with their Spaces feature, both of which are baked into OS X. 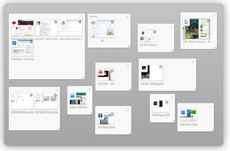 For those who don’t use a Mac, basically these features allow you to zoom out and get a bird’s-eye-view of all your windows (or tabs, in this case) that are open — and you can also arrange open windows (or again, tabs, in this case) in certain spaces so they’re clumped together. 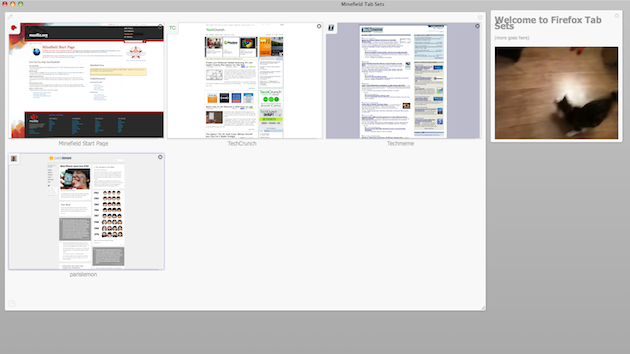 This allows you to more easily find what you’re looking for with so many tabs open. 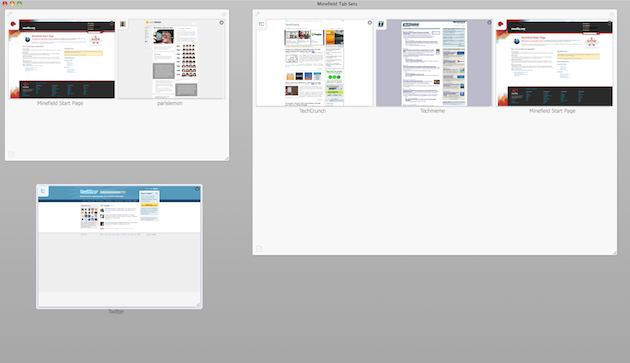 For example, when tabs are organized into a group, you can select that group and see only those tabs you put in there. The other tabs you have open (in another group) are still open, you just won’t see them when you’re focused on this particular group. And you can change the sizes of these groups in the bird’s-eye-view mode to highlight certain ones. “Make the group with your calendar and email bigger so that you can see what’s new just by zooming out to Tab Candy. Hide the group with distractions in a corner,” Raskin writes. The best part is that you can actually test out Tab Candy right now. If you click on this link, you’ll download a special “super-early” build of Firefox (Firefox 4 beta, to be specific) with Tab Candy. Again, it’s early so there are bugs and performance issues, but this is a very, very good idea.